Prototype: German Federal Railroad (DB) express locomotive road number 110 468-6 with streamlined ends ("Bügelfalte" / "Pants Crease"). B-B wheel arrangement, in the ocean blue / ivory paint scheme with the red "Egge Cookies". Built starting in 1963. 2 fast train passenger cars consisting of the types BDm, ABm in the ocean blue / ivory paint scheme, an a type Bnburzb "Kaffeeküch" / "Coffee Snack Bar" fast train passenger car in the City-Bahn paint scheme and including advertising for Schröder, the operator of a meat products company in Saarbrücken. Use: Passenger cars in commuter and long-distance service, here during the testing of the "Kaffeküch" in fast train service Saarbrücken – Koblenz in the summer holidays period of 1991. Model: The locomotive has a built-in digital decoder for operation with DCC, Selectrix, and Selectrix 2. The locomotive's motor has a flywheel. 4 axles powered. Traction tires. The headlights and marker lights change over with the direction of travel. Warm white LEDs are used for lighting. The locomotive has a close coupler mechanism. The fast train passenger cars have close coupler mechanisms. Total length over the buffers 598 mm / 23-1/2". 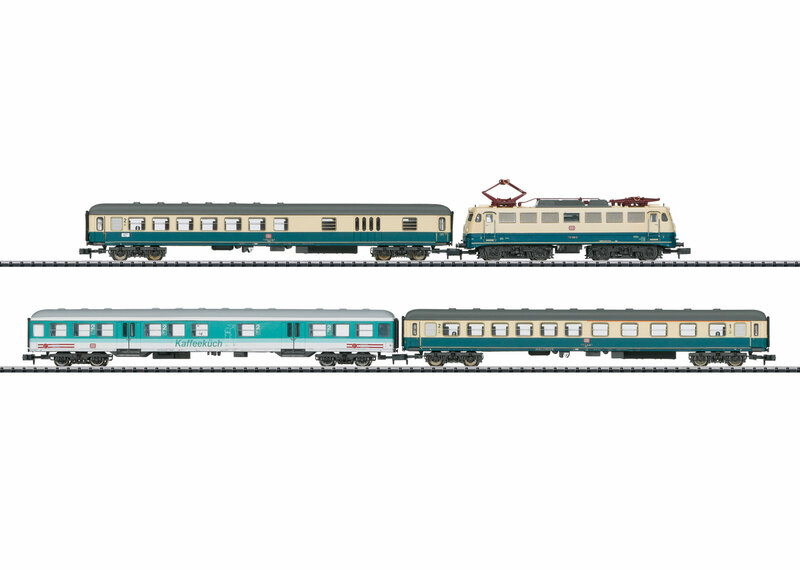 An add-on car to go with this set can be found under item number 15743. T11635 – "Kaffeeküch" Bistro Car Starting in the mid-Eighties the DB worked intensively on the problem of how to make commuter and regional service more attractive, since a large growth potential was assumed here. Yet there was no money available for new modern cars and locomotives. Around 5,000 "Silberlinge" / "Silver Coins" were present however that at that time had reached around half of their useful life and were due for major overhauls. The DB therefore decided to make the "Silberlinge" more attractive as part of the overhauls that were due. Among these overhauls were equipping the cars with new materials and colors, better seats, luggage racks and trash containers, an enclosed restroom system, an a general-purpose area with fold-down seats for wheelchairs, bicycles, and baby strollers. A new product-specific external paint scheme was also part of this in the sense of "corporate identity". Initially, various rebuilt variations were tested in the regions of Cologne/Gummersbach, Hamburg, and Stuttgart. The results of these variations was the "Hannover" design that was applied in 1988/89 to an advance series of 78 cars. A small series of 57 cars followed in 1990 for the area of Saarbrücken, whereby tend cars were equipped with a buffet compartment at the special request of the party placing the order. These cars were called "Kaffeeküch" corresponding to the Saarland dialect and were designated this way on the sides of the cars. The cars now had a dining area in the middle of the car with 16 place seats at four tables as well as five standup tables. In addition, there was a glassed in counter operated by the meat products company Schröder in Saarbrücken. In addition to coffee and kiosk items, you could also get fresh sausage dishes here. Externally the cars were very recognizable with the large lettering "Kaffeeküch", the stylized image of two people at a standup table and the advertising for the meat products company Schröder, later replaced by advertising for Coca Cola and Karlsberg beer. 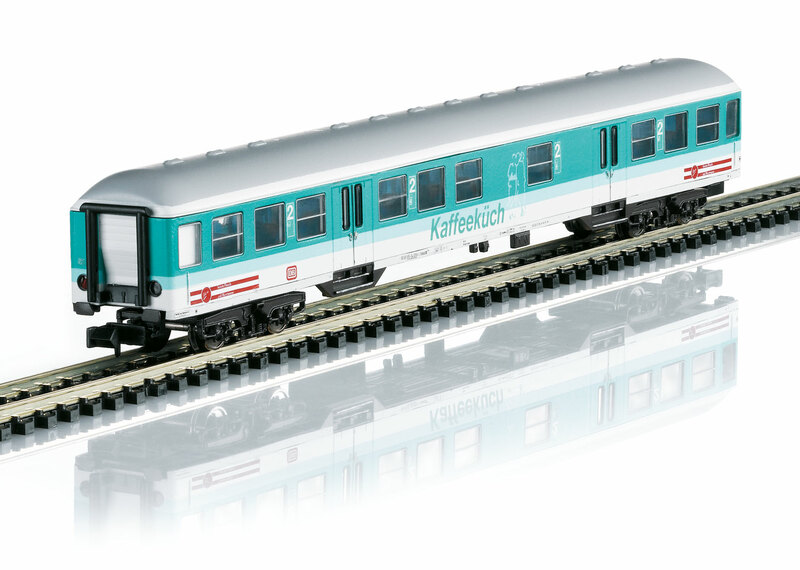 In the beginning, the "Kaffeeküch" cars ran in the CityBahn / City Railroad trains on the route Trier – Saarbrücken – Homburg – Kaiserslautern. Later they were used on the StadtExpress / City Express trains on the route Trier – Saarbrücken – Kaiserslautern – Mannheim – Heidelberg – Karlsruhe – Offenburg – Freiburg and at the end they ran with the Regional Express trains between Trier-Koblenz, whereby the catering was no done by ISB-Service from Koblenz. Their use ended in 2002/03 and most of the "Kaffeeküch" were converted or scrapped. Only one car was acquired by a private party and it is supposed to be put back into operational condition.